The University of Central Florida is located in east Orlando. While UCF and Valencia Community College students make up the majority of the area's population, many families and singles choose to live here as well to be close to research facilities and major corporations. 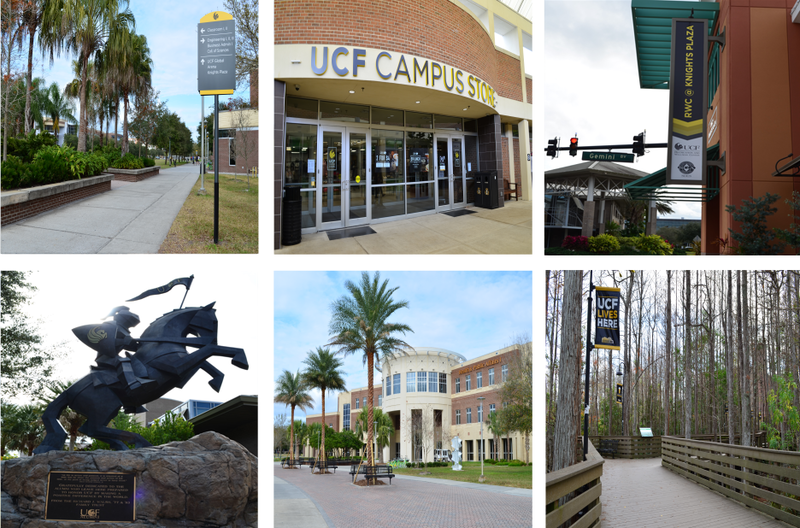 The UCF area is a dynamic neighborhood with a thriving business community and plenty of collegiate activity. There's a lot going on, and finding an apartment that fits your personal needs won't be hard in the UCF area. Apartments in the UCF area fall into one of two distinct groups. There are a lot of student-oriented apartments with all of the amenities and services that college students have come to expect. There are also a significant number of traditional apartments that serve UCF faculty and staff as well as the significant business community located in the area. The area is relatively large and spread out, so the two groups coexist symbiotically. For students, renting in the UCF area puts them close to campus and the area's college nightlife while still being only minutes away from Downtown Orlando. While the majority of non-students in the area live in single-family homes, the increased demand for apartments has lead to the addition of a number of more traditional apartments surrounding University Boulevard. These communities are conveniently located close the area's burgeoning business community, making the UCF area an excellent location for those looking to live closer to major corporations and the area's research facilities. Some restaurants in the UCF area of Orlando include Planet Smoothie, Café Mindanao, Ledo Pizza, and many more. Nightlife hot spots include many college bars and clubs, as well as sports bars and jazz clubs. Additionally, Waterford Lakes Town Center is near this area with great shopping, dining, and a movie theater. Living in the UCF area gives you easy access to the Central Florida GreeneWay (SR 417) and the East-West Expressway (SR 408). You can quickly jump on SR 417 and head south to SR 528 for a straight shot to world famous Cocoa Beach for a nice (and convenient) get-a-way, or take SR 408 into downtown Orlando in 15 minutes or less. Schools serving those who choose an apartment near UCF and east Orlando include Waterford Elementary School, Riverdale Elementary School, Castle Creek Elementary School, East Lake Elementary School, Deerwood Elementary School, Union Park Elementary School, Lawton Chiles Elementary School, Discovery Middle School, Legacy Middle School, University High School, and Timber Creek High School. Many who live in this area choose to do so in order to be close to corporate campuses like the Quadrangle on University Boulevard or research facilities like the Central Florida Research Park just south of UCF campus. The Central Florida Research Park alone employs more than 10,000 people, and is home to a number of private corporations and UCF-sponsored centers. The Siemens Corporation's Orlando divisions are located on Quadrangle Boulevard off University Boulevard, and employee 3,800 people in the greater Orlando area. Other main businesses in this area are shopping centers, restaurants, and bars, perfect for college students and obtaining a part-time job. The UCF area's proximity to SR 417 makes commuting to Orlando and metropolitan areas for work easy, and the neighborhood is only a quick 25-minute drive south to the Orlando International Airport for those who need to travel frequently for business. The closest mall to the UCF area is the Waterford Lakes Town Center. Both the Florida Mall and the Mall at Millennia are only about a 20-minute drive from UCF. With plenty of options for shopping, this is a great place to find an apartment. Some of the major intersections in the UCF area include the corner of Dean Road and University Boulevard, the corner of University Boulevard and Alafaya Trail, the corner of University Boulevard and Rouse Road, and the corner of McCulloch Road and Alafaya Trail. Traffic can get a little hectic during rush-hour during the week. University Boulevard will start to backup around 5pm on weekdays. Alafaya Trail from where it intersects University Boulevard down toward SR 408 will back up in the late afternoon when the majority of students and faculty are leaving campus and people who work around University Boulevard are leaving work for the day. Fortunately, there usually isn't a lot of traffic on East-West Expressway (SR 408) and the Central Florida GreeneWay (SR 417) during peak commute times (mornings before 9am, afternoon after 5pm), and it's easy to access both roads from the UCF area any day of the week.